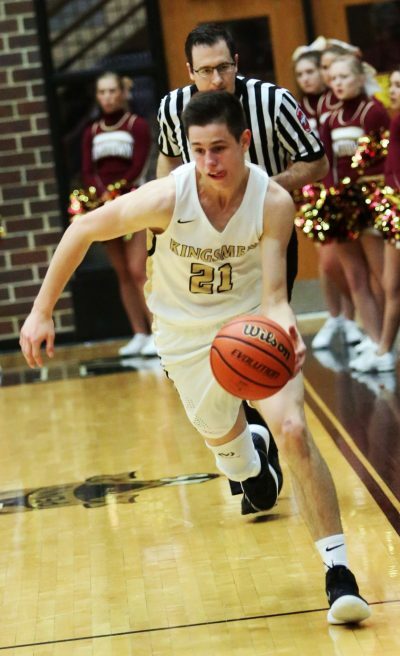 As the Penn Boys Basketball Team battled through the grind of a rugged schedule, the Kingsmen suffered four consecutive losses against a powerhouse line-up. When the Kingsmen needed a power surge, Junior Guard Beau Ludwick stepped up his game. Through the first 15 games of the season, Ludwick averaged 6.6 points a game. In the last eight games of the season, Ludwick has averaged 11.3 points a game, and the Kingsmen have blasted off to six victories. Ludwick stung Mishawaka for 15 points in Penn’s 52-48 victory against the Cavemen on their own court in Tuesday’s Sectional opener. Ludwick scored five points in a 55-50 loss to the Cavemen in the regular season. “As the season has progressed, I have gained confidence and started to knock down more shots,” Ludwick said about emerging as more of a difference-maker. Ludwick has an impact in all aspects of the game. He averages 8.3 points a game for the season and 4.9 rebounds. Ludwick, who is 6-foot-0, has 68 assists and 47 steals. He has also blocked eight shots. Avenging the victory against Mishawaka put Penn in the Sectional semifinal round against South Bend Riley. Ludwick is also a pitcher on Penn’s Baseball Team, and he has embraced the challenge of being a two-sport athlete. “Being a two-sport athlete has physically and mentally prepared me to be ready for the long seasons,” Ludwick said. “Baseball helps me in basketball by staying mentally focused when the season seems long, to just take a step back and remain concentrated and focused.